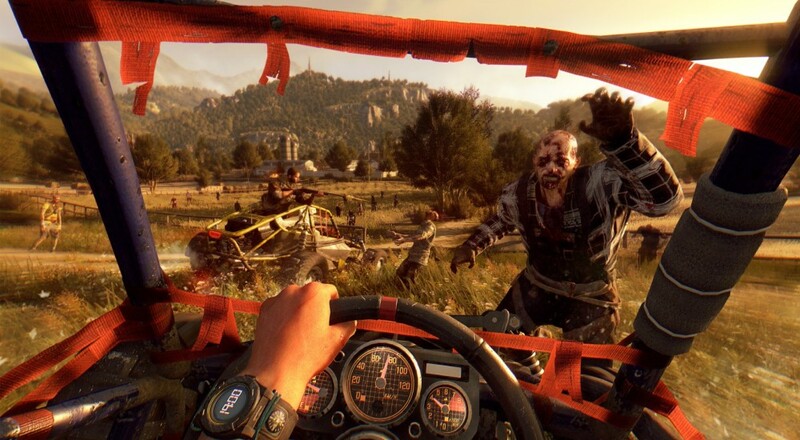 Nothing says "zombie apocalypse" like "dune buggy racing"
Dying Light is doubtless worth your attention if you're a fan of parkouring around ruined buildings and love zombies. Or maybe you hate zombies. Zombies are weird like that. Maybe you yearn only to crack them open wide with a police baton or, in the case of "The Following" DLC, a suped-up dune buggy. Two Techland Devs recently plopped down in front of a TV camera and recorded themselves watching some pals play the new Dying Light DLC, noting some of the new features added to the game. "The Following" takes place in a sprawling expanse of land (known as "the Countryside") where free-range zombies roam until you pancake them on the bumper of your overcharged go-kart. It's an entirely different beast than the tightly packed urban area of Dying Light, but looks compelling in a new way. Let Techland's own Maciej Binkowski and Pawel Modlinski show off some of the new toys you and your friends can play with. I thought Dying Light looked pretty good, but you were also watching the events of that game unfold amidst a ruined city. Sure, the Countryside might still be lodged in the depths of the apocalypse, but it's not all blown out buildings and burning piles of garbage everywhere. Sometimes you just need to leave the rubble of civilization behind and engage in a scenic dune buggy race with your co-op partner through some country roads. In other Dying Light news, a demo for the game is now available! Six months after the game. Somehow. The demo is co-op focused, letting four friends explore the Slums area with three hours of "unique content" and a story quest chain. If you've been on the fence about Dying Light for sixth months, why not give it a test run with some like-minded individuals with negative attitudes towards the undead? Despite being half a year old, Techland wants Dying Light in the hands of as many zombie-hating enthusiasts as possible. "Demos were pretty much standard in the previous generation, but suddenly they've become few and far between. So we decided to use some of our resources to release a demo now and let everyone experience our game first-hand," said Tymon Smektala. If you've got some pals with a grudge against shambling, nightmarish horrors, go ahead and give the Dying Light demo a try. We liked it quite a bit. Page created in 0.2783 seconds.